Great Britain claimed three diving medals on the penultimate day of competition at the 2018 European Championships. Grace Reid and Alicia Blagg celebrated a one-two finish in the Women’s 3m Springboard event. 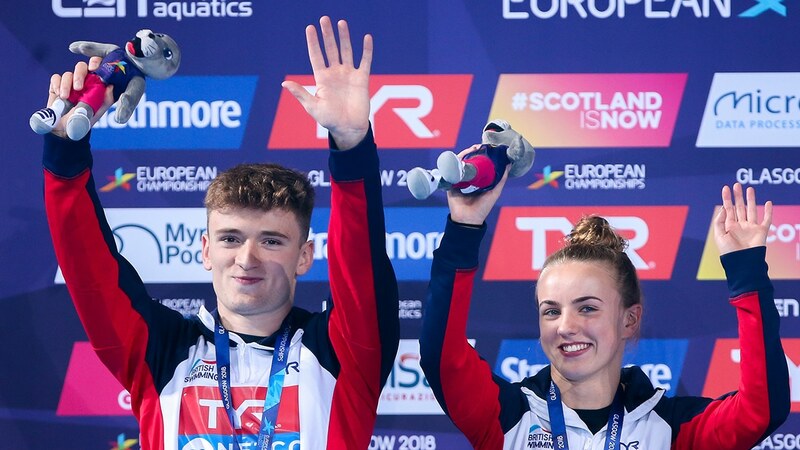 Dive London Aquatics’ Reid topped the podium with a score 329.40 but was pushed all the way by British team-mate Blagg, who won the silver after finishing on 327.40 points. Germany’s Tina Punzel was third with a score of 324.65. Matty Lee and Lois Toulson had to settle for a silver medal after a thrilling Mixed 10m Synchro final. They were only 1.83 points off gold medallists, Russia’s Nikita Shleikher and Iulia Timoshinina, after scoring 307.80 at Edinburgh’s Royal Commonwealth Pool. An impressive Back 2 1/2 Somersaults 1 1/2 Twists Piked (5253B) in their final dive scored 75.84 to guarantee them a place on the podium. Toulson added: “The championships have been great for me, I’ve got two medals so I’m pleased with that but obviously I would’ve loved to get gold today with Matty but as I always say that is the nature of sport. The Russian pair finished on a total of 309.63, with the bronze medal going to Germany’s Floria Fandler and Christina Wassen after they scored 278.64.